A buddy of mine just released his new iPhone game Mine Blast, cool puzzle concept, not one I have ever seen before. He poured an amazing amount of effort into it…I am very curious to see how it does. With millions of apps sold every year (2.5 billion to be exact) there is still room for the little guy to play. With sales expected to grow from $4.2 billion in 2009 to $29.5 billion in 2013 the market is attracting more and more players. But this is still the wild west, it is the garage development of the 1980s, anyone can do it…this is literally where Apple came from. If you have an iPhone or a iTouch download Mine Blast, try it, comment on it, send the link to a friend, reward the little guy. I am not suggesting that coming up with a concept and implementing it is easy, I saw what went into this idea, the learning, the revisions, the testing…. You have to really want to get it done, you have to have a good idea and you have to be talented…but…there is no barrier to entry. Sure the companies that pay to get on the main page the Apple App Store will get some initial attention but do the get real return on investment? In a market where all hardware is made in Taiwan and all software is expected to be free, this is still a chance for the little guy to make something fun and get paid for doing it. I will admit right up front that Mine Blast was created by a close friend of mine. But that shouldn’t stop you from buying it, and for $0.99 it is an easy decision. It is a puzzle game in the same genre as MineSweeper for the PC but with much more intelligence and depth. 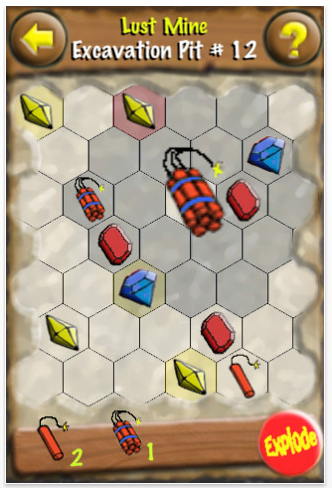 The basic premise it that you are trying to dislodge gems from the walls of mines using various explosives. You need to place the explosives so that each gem is impacted only once. You need to clear all of the gems to clear the mine. As gems are cleared and more mines exposed the difficulty increases. To increase the difficulty more gems are added. New types of gems are added, these ones requiring two or three explosions to dislodge. More explosives are added that cover wider areas, pre-placed explosives are added that are triggered by your explosives. Each mine is unique. I have been playing it for a while and am still only on the second level. The concept is simple, even my 6 year old was able to grasp the game play in a couple minutes but actually solving each level is much more involved. Solving the mines requires spatial perception, problem solving skills and patience. Forget Brain Age, Mine Blast is definitely a good exercise for your mind. This app is very well developed in all the areas that count. The graphics are polished and clean, the navigation is simple, direct and error free. The gaming concept is focused, simple to understand yet hard to master completely. The increasing difficulty keeps you coming back but it never strays too far from the basic concept. The help system is animated using the actual game engine allowing you to understand, as more options are added, what each items does and what is expected of you. If all games on the AppStore were this polished it would be much harder to decide what to buy and what to ignore. Let’s hope there are many more apps like this to follow. I hope Shano makes many, many loonies with this new venture. Good going. Very cool blog post! :> Inspired me to do one like it! Thanks, the energy is contagious!